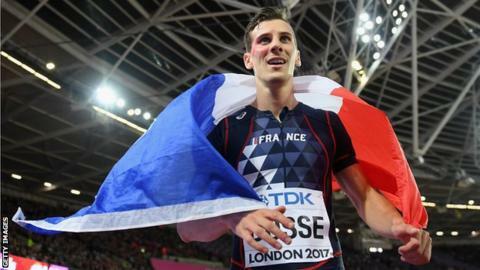 World 800m champion Pierre-Ambroise Bosse says he has sustained "multiple facial fractures" in a "violent assault" which has ended his season. Frenchman Bosse, 25, took an unexpected gold at the World Championships in London earlier this month. But on Wednesday he posted on social media that he was attacked by three individuals on Saturday, adding that an investigation is now under way. "I suffered unspeakable psychological damage," he added. "For all these reasons, my season ends from today." Bosse was due to compete in the annual DecaNation in Angers on 9 September.